Both Janis and Mark grew up on a family farm. Janis' parents have an organic vegetable, poultry and beef farm and Mark's parents have a cow/calf beef farm. They hope to instill the farm life and values to their children. Cameron already loves the farming life, he can be found playing with his tractor toys. Nathan loves helping in the fields picking and hauling in the flower harvests. Megan is already picking up tips on arranging flowers. The fresh cut flower business is a family affair, everyone is out picking, packing and selling flowers. Cameron and Nathan have grown up at the market, they look forward to introducing Megan to the ins and outs of selling market bouquets. Mark and Janis purchased Janis' Grandparents former dairy farm. Grandma and Grandpa's love of flowers is apparent on the property. There are many established flower gardens filled with collections of lillies, irises, peonies and lilacs. In total there is approximately 3 acres in flower production. Corn/soyabean fields have been turned into sunflower fields. Lawn has been turned over for perennial beds. The farm is being revitalized and beautified with every growing season. Every year the flowers we grow have increased in number and variety. 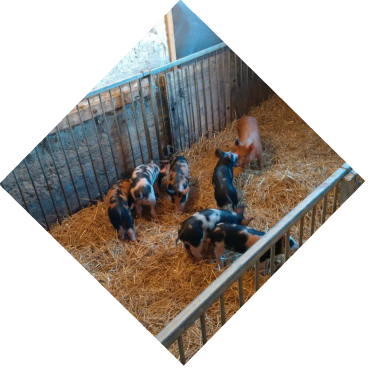 Along with the flowers, pastured pigs are raised on the farm. Healthy, happy and MUDDY pigs.The pigs have access to outdoors and are cared for in the best way possible, hands on and one on one with each animal. You will often find Mark in the sows' pens brushing them. Literally "Grandma's garden" of flowers as well as field production of flowers. 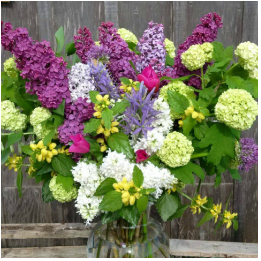 We sell mixed bouquets at the Horton Farmer's Market every saturday from Mother's Day to Thanksgiving. Pastured Pork is also available by the half or whole. 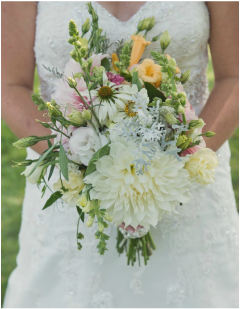 Contact Janis Harris to discuss flowers for special occasions and weddings.